Knee pain can be quite a hurdle to overcome. The fact that we require their use in so many activities makes it difficult to rest and rehabilitate them. Fortunately, we have had much success diagnosing, treating and rehabilitating the knee with acupuncture and Chinese herbal remedies. Acupuncture therapy is becoming a popular option of alternative treatment to reduce pain and improve function of the knee, and it is based on thousands of years of observation and treatment, and nowadays more on clinical study and extensive research. The anatomical structure comprising of femur (lower end of thighbone), tibia (upper end of the shinbone), and the kneecap along with the numerous muscles, tendons and ligaments helps serve its function. Depending on the type of knee pain that the patient suffers from, some of the common symptoms include swelling, stiffness, redness or purple skin discoloration, tenderness, reduced range of motion and pain when it is moved, grating sound and a loss of flexibility. For the Osgood-Schlatter disease, one symptom indicating an inflammation in the area is tightness of the muscles in the thigh. Also, athletes have often reported weakness, tingling, a pins-and-needles sensation, and numbness at the site of pain in sports related injuries. It can be a torn ligament or cartilage, a fractured kneecap, infections, hemarthosis, bone tumors, knee arthritis and bursitis, cysts, obesity, or a serious accident that causes damage and strain on the knee more than it can bear. Since rapid and sudden movements, twists, landings from jumps and direction changes are some of the major causes for knee pain, the problem is often associated with athletes and their various respective sports. However, biologically, increasing age, too, makes a person deal with the increasing degeneration and loss of the amount of cartilage in the area that leads to injuries and/or pain. A form of Chinese medicine, acupuncture sessions work by means of inserting thin, sterilized needles into the human body on specific acupoints. With a release of endorphins and other natural painkillers in the system, it manages to enhance the healing process and restore the balance impaired from the obstruction along the meridians. An objective evaluation, acquired on the basis of conditions and reports of orthopedic test and physical exams, precedes designing a treatment plan for the individual. Approximately four to ten needles are usually placed in the area for a time of about ten to thirty minutes. Heat and moxa balm are applied at the site at the time of treatment to aid in recovery. The patient’s condition is most often alleviated within 6 – 10 sessions, while most start feeling relief after the first couple of sessions. The needles are placed at different depths, at both local and distal points, and twirled or used simultaneously in addition to electrical or heat stimulations. Chinese herbs also facilitate the process of healing. 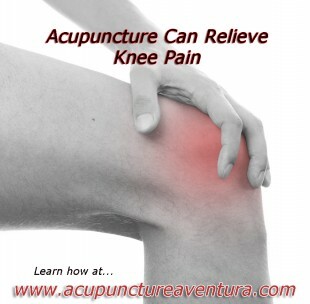 Acupuncture is able to effectively deal with knee pain, including arthritis in the joint area, successfully. It significantly reduces pain and/or disability while aiding muscle flexion and strength among the patients who are treated at our center. In most cases, it is even a better substitute for surgical treatment. It is safe as well as time and cost-effective. Do you have any questions about knee pain and acupuncture? Let us help you start getting out of pain today! Call us at 786-537-7022 to learn more or to schedule your first treatment session.